Although many of their peers have long since retired, both Robert Briskman (NAE, 2014) and his wife, Lenore, are still hard at work. The latest challenge for Rob, a renowned pioneer in satellite communications and co-founder of Sirius XM Radio, is finding ways to protect satellites from orbital debris. And Lenore continues to manage American Classic Clothes, a successful children's clothing corporation that she launched almost three decades ago. 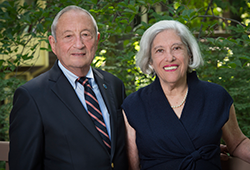 Even so, Rob and Lenore found time to plan for the future, and they've designated the National Academy of Engineering as a beneficiary to their estate. "The NAE  and the Academies  provide good, sound advice on some very important issues, and the government certainly needs it. If you're looking for an organization whose work will help your kids, grandkids, and others, it's important to support the Academies' efforts." Rob was elected to NAE just a year ago, so both he and Lenore are excited about getting involved in other ways, too. Although Rob has received many awards and professional honors, his NAE membership is in a different class. "The NAE is a working organization that tries to improve things. So being elected is special." Is a CGA right for you? Use this calculator to see the benefits.